If you are interested in one of the programs listed below, come to an Info- Session. Info Sessions for all training programs are held at our Training Center located at 3016 Martin Luther King Jr., Ave, SE. at 9:45 AM every Monday and on the following Tuesday when there is a holiday on Monday. Today's job market is competitive. Having certain qualifications and professional training programs under your belt is the perfect way enhance your skills and get a job. For 2018, OIC/DC was ranked as the Number One program by the DC Board of Nursing for participants that passed the Board of Nursing Exam for receiving their licenses. Home Health Aide is one of the fastest growing occupations. Between 2010 and 2020, the employment growth, in Home Health Aides, is expected to be 69%, which is much faster than the average growth observed for all other similar occupations. Similarly, employment for personal care aides is expected to grow by a massive 70%—again, much more rapid compared to other occupations. At the conclusion of the program, participants will be placed in employment. National Certification in Customer Service is an industry-driven and -endorsed credential that helps employers recognize qualified customer service professionals. OIC/DC's certified Customer Service Specialist Program prepares a skilled workforce for hospitality, retail, and other service industries. The length of the course varies based on the participant. Youth that enroll in the program may receive a stipend. At the conclusion of the program, participants will be placed in employment. A+ (A Plus) is an entry-level computer certification program for PC computer service and help desk technicians. In order to receive the CompTIA, A+ Certification, students must pass two exams: 220-901 or 1001 and 220 902 or -1002 for installing, maintaining, customizing, and operating personal computers. Our A+ Computer Repair Certification Program teaches the latest skills needed by today's computer support professionals. The CompTIA A+ certification is the national standard for entry into the professional IT world. This in-depth training course teaches the student how to install, repair, upgrade, configure, optimize, troubleshoot, and perform preventative maintenance on personal computers and operating systems. The A+ certification by CompTIA is an international and vendor neutral certification that has been endorsed and recognized by industry computing manufacturers and organizations. Being certified in A+ is a typical requirement if you are looking to enter or further your career with companies like Microsoft, HP, Cisco, Novell, CompuCom, Ricoh, Staples, and more. Also, students will be trained to receive a national recognized certification in IT Fundamentals. The IE&T program utilized labor market data, job postings and descriptions, along with CIP & SOC Codes to determine standards and competencies for developing IET learning outcomes to assist students in meeting certification requirements. The length of the course varies based on the participant. Youth that enroll in the program may receive a stipend. At the conclusion of the program, participants will be placed in employment. Let our BOSS training course maximize your potential and accomplish more. Business Office Support Specialist with Microsoft Office Certification (BOSS/MOS) is designed to assist students in gaining certification to become a Business Office Support Professional with a national certification in Microsoft Office (certification exams to demonstrate high proficiency in Microsoft's Office Software Suite.) BOSS prepares students to support business information operations by using computer equipment to enter, process, and retrieve data for a wide variety of administrative purposes. The curriculum includes using basic business software and hardware, business English, customer service, telephone skills, list maintenance, preparing tables and graphs, receipt control and preparing business performance reports. This course prepares participants for jobs in the government and private sector as: Secretaries and Administrative Assistants ,Office Clerks, General Office and Administrative Support Workers, Customers Service Representative, Receptionists and Information Clerical, File Clerks, Interviewers, Human Resources Assistants. The length of the course varies based on the participant. Youth that enroll in the program may receive a stipend. At the conclusion of the program, participants will be placed in employment. 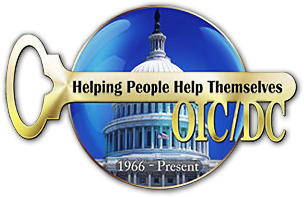 OIC/DC is passionate about helping people turn their business idea into a reality. We provide intensive training and technical assistance to people with a promising idea and a desire to start their own business. The business-related use of technology and the internet is also thoroughly explored. The objective of the program is to assist participants in the preparation and implementation of a specific, comprehensive business plan tailored to each entrepreneur's needs. If you are serious about pursuing your entrepreneurial dream, then OIC/DC is the place for you. The length of the course varies based on the participant. Youth that enroll in the program may receive a stipend. While bringing together all of the services of a traditional employment & training program, Family to Family adds a focus on the family, to assist families in gaining economic security and create enhanced family and community stability. Working in concert with our partners, the program engages unemployed or underemployed adults. We provide an array of pro-active developmental services for families. This is a mentoring program where a successful ex-TANF family is matched with an existing TANF family. The program is 3-4 months, three days per week. At the conclusion of training, participants will be placed into employment. Participants receive a stipend. At the begining of training, the participants’ day is divided between the Education Phase and the Work Readiness Phase. During the Education Phase and Work Readiness Phase, the participants will raise their grade levels to proficiency and take and pass the National Work Readiness Credential. At the successful conclusion of the Education Phase/Work Readiness Phase, a participant will begin the Work Experience Phase after certification in Work Readiness. Work experience will lead to full time employment. Youth may receive a stipend.